After being poised to dominate the android market in 2009 and 2010, HTC had a relatively quiet, even underwhelming year in 2011, suffering from brand dilution with an alarming number of handsets released last year. However, this year HTC gives the market a flagship handset for all of us to concentrate our attention on, and at this the One X is resoundingly successful, giving anyone with even a vague interest in smart phones something to marvel at. Facing stiff competition from the market dominator the iPhone 4S as well as from offerings from other Android based smartphones, most notably the Samsung SIII, the HTC One X is a fantastic handset with an impressively fluid interface. Social media presence is strong on the One X, with Twitter, Facebook and Google Plus apps coming inbuilt on the phone, as well as widgets for said social media sites. As you’d expect, all of the apps run very smoothly on the One X, and browsing through photos on these sites, as well as on instagram, tumblr and the like is, as with everything else you do, made a joy thanks to the phones outstanding screen. Widgets are also available for each social media site (for those unfamiliar with ‘widgets’ on smartphones, they’re basically extensions of the application which you can access on your home screen without opening the app), which make your social media experience significantly more immersive, as you can now check your Facebook and Twitter feeds by simply scrolling across your screen. Additionally, the One X allows you to sync your Facebook contacts into your phones contact book – the problem is you can’t select which of your Facebook friends go into your log, it’s either all of them or none of them, and it’s doubtful that you’d want all of your Facebook friends in your contact log. Nonetheless it’s a step in a very interesting direction, and it certainly makes you think just how prominently social media will be on a functional level to smartphones in the future. The first thing anyone notices about the HTC One X is its screen – the 4.7 inch HD screen finds the balance between undersized (iPhone 4S) and oversized (Galaxy Note). Female users and males with smaller hands may navigate the expansive screen somewhat troublesome, but it soon becomes natural – and the learning curve is more than worth it. The screens viewing angles are some of the best on any smartphone, and the 312 pixel per inch resolution is immediately striking. The One X is currently only available in white, but that’s fine; while some smartphone designs look ugly in white, the One X pulls it off, looking very sleek and stylish. The matte white look is embellished by the polished silver camera bezel and HTC symbol on the back of the phone, and the matt black surrounding the screen, making it very easy to look at from either side. The phone is also impressively thin, and while the Samsung Galaxy SII, and now the Galaxy SIII achieved the thin look at the cost of feel, feeling quite plastic and cheap, the One X has a good amount of weight to it, though it may feel a bit delicate if you’re used to carrying an iPhone 4 or 4S. The One X is one of the best looking phones in an increasingly style-conscious industry. 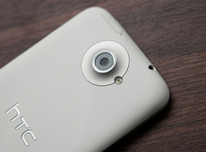 Also of increasing importance in the smart-phone market are cameras. The One X features an 8 megapixel camera that produces images of largely equal, if not slightly better quality than the iPhone 4S. Like the 4S, which also features an 8 megapixel camera, the One X can record videos in beautiful 1080p (full HD), but unlike the 4S it can also it can also shoot photos both during video recording and in video playback, and, quite impressively, the One X can also play videos back in slow motion, though only in 480p. Both image and video playback are made even more pleasurable by the handsets screen, which outputs in 720p. The camera faces fierce competition from the One X’s android brethren, with both if Samsung’s most recent offerings in the Galaxy Note and the Galaxy SIII featuring 8 megapixel cameras and full HD recording capabilities, with similarly sharp displays. However, if you’re used to an iPhone, the One X offers slightly better image quality with a significantly more responsive camera; as the camera has a dedicated processor of its own, its speed is crazy fast, taking a user only about 4 seconds to get from home screen to picture taken. The camera also comes with some popular filter styles that can be applied to the image preview before you even take a picture, which users who are into instagram-like photography will surely enjoy. The camera is definitely a strong point. What’s good but not great about the One X though is its music player. It comes with in-built Beats audio software which boosts the volume and quality of all the sounds the phone makes. 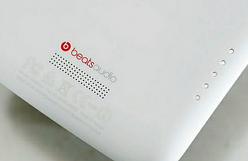 The Beats software can be toggled on and off, and while it certainly improves sound quality when on, the sound outputted by the iPhone is still noticeably louder and a bit sharper. This may not be a big deal for people who don’t like their music full volume, but it’s something to consider for those who do. The default music software that comes with the One X is unremarkable, but thankfully there are plenty of alternatives to be found on Google’s play store, many of which have more stylish interfaces than the iPod software used in iPhones, but again, none of these actually improve the sound quality. The phones performance in every other area is stellar. The phone features a quad-core Nvidia processor with a Tegra 3 chipset and just over 1GB of RAM – if that is all indecipherable to you, it simply means the phone is really, really fast. During day to day use the phone very rarely lags, even if you’re browsing the internet or watching a video with a background download in progress. The phone has 32GB of storage space, which isn’t terrific but it’s definitely enough. The touch-screen is responsive and connectivity is usually good. One problem I have encountered is the phones public mobile connection can infrequently stop working, meaning you can’t access the internet without a Wi-Fi connection, but this is easily fixed by just restarting the phone. I will say though that no other users I’ve talked to have encountered this problem, so maybe it’s just the carrier. The One X uses a fusion of the Android 4.0 operating system with HTC’s own Sense user interface, which overall works very well. The phone comes with over 20 default wallpapers and the now iconic HTC clock widget preloaded. All of these default wallpapers look terrific with the screen quality such as it is, and beyond this you can also set live wallpapers which are wallpapers that have some moving animations, but these tend to use up battery a bit quicker. Notable amongst these is the ‘Live Weather’ live wallpaper, a dynamic wallpaper that changes with the weather conditions around you. As with all android phones, the One X comes with the Google Play store, which is similarly full featured as Apples App Store, with myriad games, music, books, movies and apps of various descriptions. I know many iPhone users who cite a phone without the App Store as a big drawback, but there’s very little difference in the availability of apps in the two stores, and in fact the Play Store features many more interesting apps due to the significantly greater customization capabilities of the Android operating system. Everything, from widgets to keyboards to text messaging software can be replaced, changed or customized. You will quite literally find something new to customize or play around with almost every day. 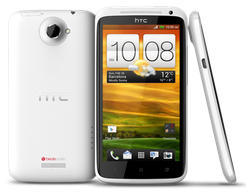 Since its release in late April, the HTC One X set the standard for a smartphone, both in terms of performance and style. Now, the newly released Samsung Galaxy SIII absolutely obliterates all competition in terms of technical specifications, and it also has some nifty gesture technology. However, new technology comes along every day, and any given phone is only the technical powerhouse of the industry for months at most – beyond technical specification, the HTC One X represents excellence in design and interface, and is easily one of the best smartphones on the market.